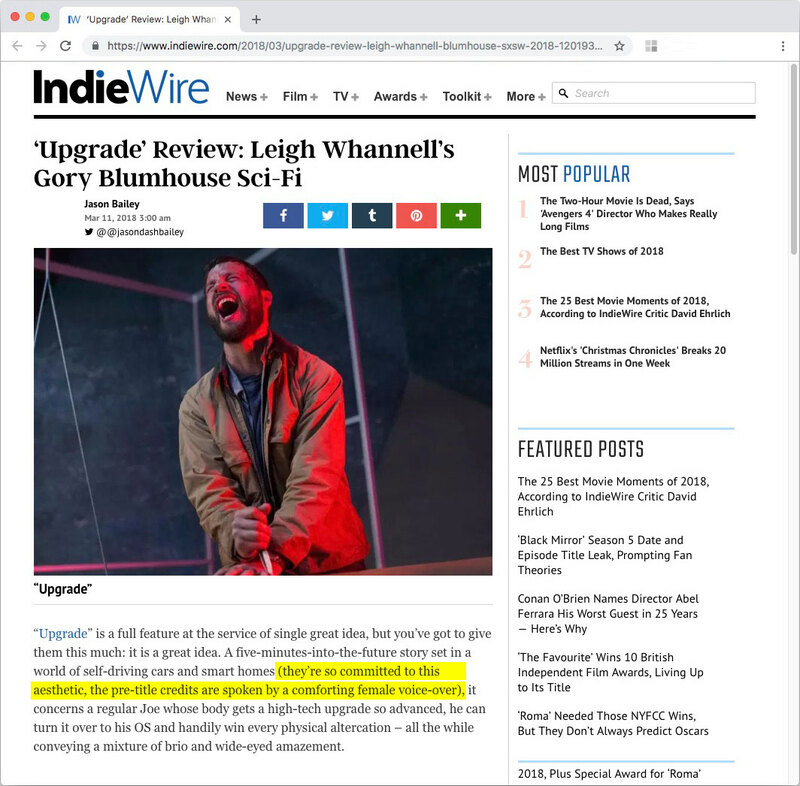 The feature film Upgrade was described to us by director Leigh Whannell as a sci-fi with elements of action and mystery. Notably it features a powerful Artificial Intelligence (AI) “character” that is heard, but never seen. With this in mind, Leigh had the idea of creating what may just be the world’s first spoken-word (and textless!) opening credit sequence. We were asked to come up with an approach to this that would support the narration of credits appropriately yet abstractly, and introduce us to a world where AI plays a significant role. Beginning with a 2D audio waveform similar recognisable to audiences from Siri and other current-day digital voice assistants, sound waves then split outwards to become 3D topography, representing a growth in awareness of the AI. The world of Upgrade begins as does our own according to Genesis: “without form, and void”, and it is the spoken word (of the AI no less!) that brings forth and shapes existence. The topology of data (sound as 2D waveforms) becomes and shapes the topography (world creation). The visual concepts of Genesis and waveform-as-landscape were combined with the idea of data-gathering, and the notion that the AI is becoming more aware of its surroundings. Each vocalisation helps to refine a picture of the world, as sonar and laser scans would, or as AI might build increasingly sophisticated visual representations of its surroundings. The environment progresses visually from hills to houses to suburbs and to the city, and these levels of detail echo the increasing complexity of man’s environment over centuries through technological achievement. In doing so the lines shift from primarily organic shapes (nature) to the purely technical (man) until swallowed by the exponential singularity (AI). End credits were requested to be kept simple, but remain sympathetic to the film. Letterforms were built on a pixel-grid to materialise and dissolve to bring text on and off screen. The sequence is a continuous push-in through grids and data fields of lines and dots echoing the continuous camera move of the opening titles. 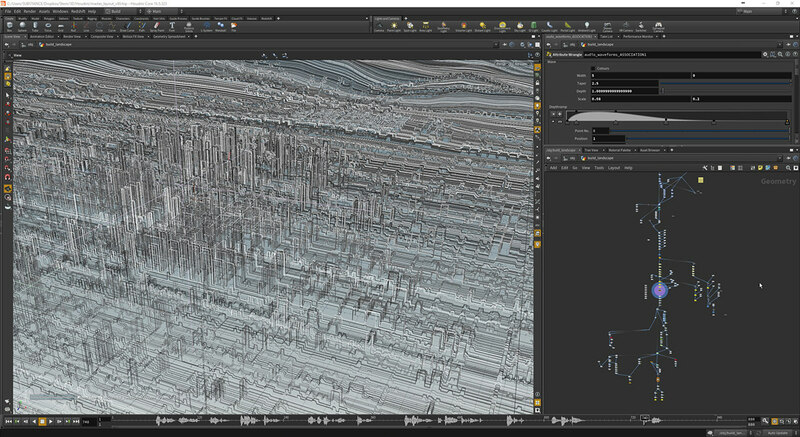 In the background of the credits are faint schematics - a skull, a spinal cord, mechanics - just enough to add texture. 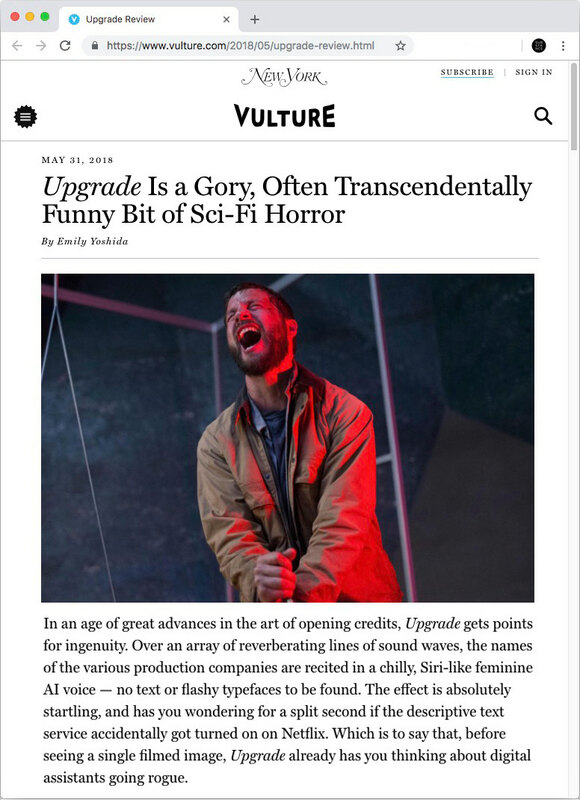 The feature film Upgrade was described to us by director Leigh Whannell as a sci-fi with elements of action and mystery. Notably it features a powerful Artificial Intelligence (AI) “character” that is heard, but never seen. With this in mind, Leigh had the idea of creating what may just be the world’s first spoken-word (and textless!) opening credit sequence. 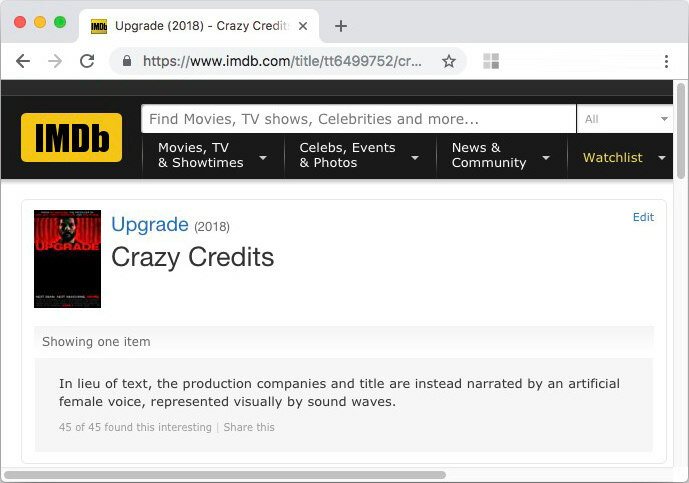 We were asked to come up with an approach to this that would support the narration of credits appropriately yet abstractly, and introduce us to a world where AI plays a significant role.